The small southwestern Ontario town opened itself up for a wonderful weekend of celebrations and activities in culmination and celebration of being the host of Kraft Hockeyville 2018. Kicking off on Friday and continuing on Saturday with a number of community events, the excitement continued to build through the weekend, with a focus on the arrival of the Toronto Maple Leafs and Ottawa Senators on Monday evening. Hosting an NHL pre-season game is the pinnacle of the Kraft Hockeyville experience and Lucan was ready to welcome their hockey heroes to their renovated rink. The Lucan Community Memorial Centre, which was nominated in Lucan’s bid for Kraft Hockeyville 2018, received $250,000 for upgrades to the arena as part of the grand prize. Things really ramped up bright and early on Tuesday morning as a large crowd gathered outside the arena to welcome the Leafs and Senators for their morning skate. The teams then hit the ice in-front of a packed arena for a pre-game skate to get a feel for their small-town surroundings. The energy and excitement was incredibly high as the stands were packed with school children who were pumped to see their favourite players hit the ice that they themselves skate on each season. 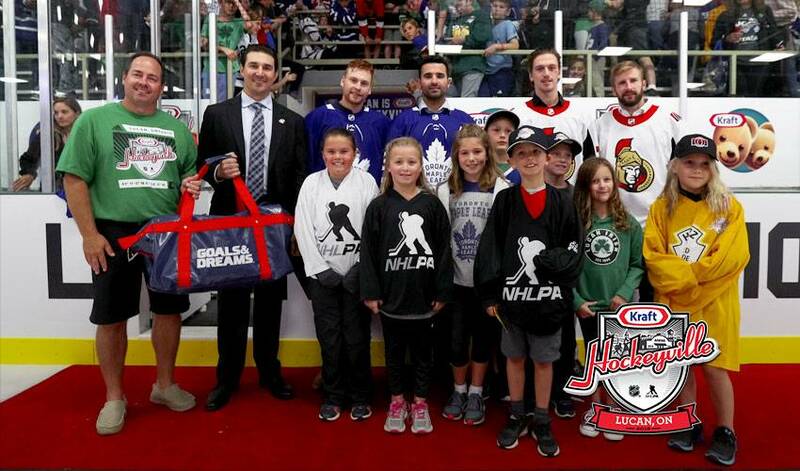 Following the morning skate’s, Nazem Kadri and Connor Brown of the Maple Leafs and Thomas Chabot and Tom Pyatt of the Senators joined NHLPA Divisional Player Represenative, Chris Campoli, and a number of local Lucan minor hockey players in celebrating a donation from NHLPA Goals & Dreams of $10,000 worth of brand new hockey equipment. The donation is part of the Kraft Hockeyville 2018 grand prize and a lasting legacy of the players participation in the KHV program. With the practices and community events completed, there was only one thing left in Lucan’s Kraft Hockeyville experience – the game between the Maple Leafs and the Senators. With the renovated arena bursting at the seams, the two teams dazzled the crowd with an up-tempo and highly competitive game. To the delight of the majority of fans in Lucan, the Maple Leafs came away from the night with a 4-1 win. As the festivities of Kraft Hockeyville 2018 wrap up, it’s crystal clear that the people of Lucan should be extremely proud of putting on a fantastic celebration, something that the community will never forget.